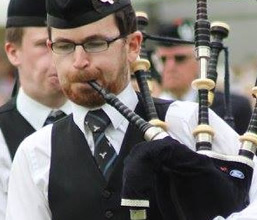 Jonathon Simpson is a Wedding Piper based in Edinburgh and covers weddings and events throughout Central Scotland. Having a bagpiper play at your wedding or event is very traditional throughout Scotland, I have covered many weddings, Burns’ suppers, corporate events and reunions. During my playing career I have travelled across Europe and the northern hemisphere, including Canada, Belgium, Austria, Russia and Japan. In addition to playing, I also tutor pupils who often compete successfully in band and solo piping competitions, I am in demand to teach at piping workshops in Scotland and beyond.